Couple of years ago with my cousin we decided to visit Lake District and Hadrian’s Wall. Visiting the district was my cousin’s dream for many years while I was always fascinated by the wall. So it all looked like a great trip coming. Our adventure couldn’t start better. We drove from London and arrived to Windermere in the late afternoon. From there we drove A595 over the spectacular Kirkstone Pass (at 454 m above the sea level the highest pass in the district open to vehicular traffic) then along equally scenic Ullswater before stopping for a night in Penrith. It was a glorious day and we were looking forward to the next day. Well, it couldn’t start worse. It was raining, it was windy and it was foggy. Classic Lake District weather. Still, we didn’t give up and bravely drove into the hills hoping for the best. We were touring narrow lanes of the district with heating in our car running high trying to convince us that it is actually warm. Obviously it didn’t work as any time we left the car for even the briefest moment the wind hit us with a full force of hurricane, chilling us to the bone. Damn, it was just mid September, I don’t even want to know how it is there in January. Finally we arrived at Honister Pass. Road B5289 leading there was as scenic as A595 the previous day but we couldn’t really appreciate the views as visibility was poor (actually, non-existent would be a much better description than just poor). At the top we stopped for a tea in a vane hope of trying to wait out the rain. It didn’t work and after an hour or so we decided to drive down and head to Carlisle when we had rooms booked for the night. When I woke up the next morning I could hear both, wind and rain, bashing my room’s windows. So, here we go again. But still, we didn’t give up and headed to the hills as bravely as the previous day. This time we decided to go to the coast first and by the time we arrived to Whitehaven the sun was out and our holiday started looking like, well, a holiday. From the coast we went to Wast Water, all the way to the road’s end where one of the trails leading to Scafell Pike begins. We were even a bit tempted to try and climb it but weather was too unpredictable for that. 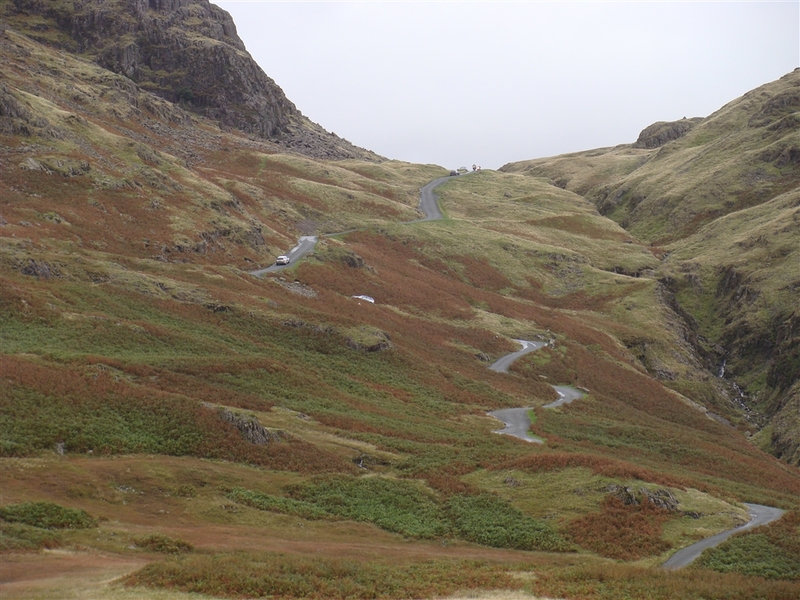 So instead we decided to drive yet another spectacular road and cross the Hardknott Pass. This was by far the most fun to drive from them all. The road zigzagged crazily but still managed to achieve an incredible gradient of 1 in 3 (about 33%) which means that it vies with Rosedale Chimney Bank in North Yorkshire for the title of steepest road in England. 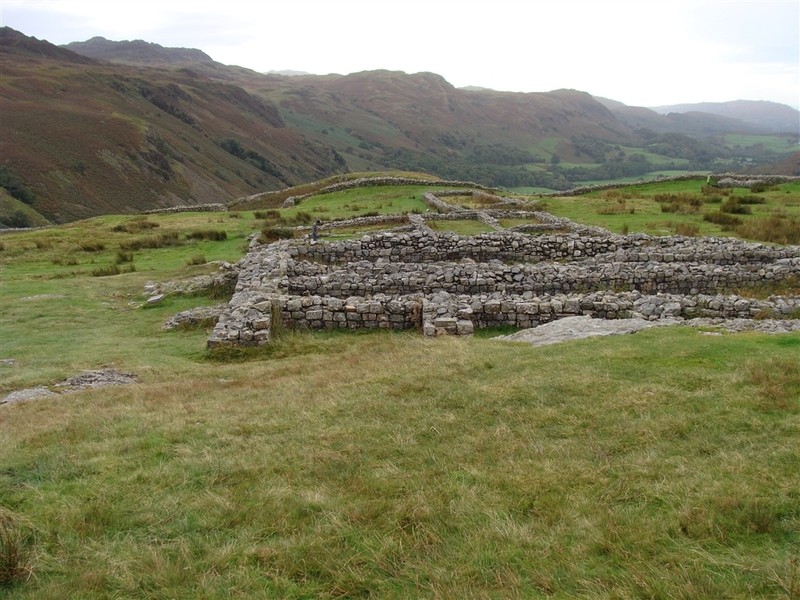 One of the main reasons for venturing this way (apart from the fun of driving of course) was visiting the Hardknott Roman Fort which is located west of the pass in a totally, absolutely middle of nowhere. Even if weather was far from perfect (as the sunshine was long gone and chilly wind was trying to kill us again) I absolutely loved the place. The bad weather actually make the experience better as it really helped imaging the hard life of Roman legionaries. Some of them most likely walked all the way from the warm coast of Adriatic to be posted on this dark and cold frontier of the empire. To create some degree of comfort for themselves the Romans even built the baths. Still it had to be hard life here. The layout of the fort is well visible as are remains of the foundations of many of its buildings (including the baths which were located outside the main fort). From Hardknott we drove across yet another pass (the Wrynose Pass this time) and headed back to Carlisle which has become our base for exploring the region. The few days we spent in the Lake District looked quite the same; a constant battle with crazy weather,(except for some flashes of glorious sunshine) and lots of scenic driving. 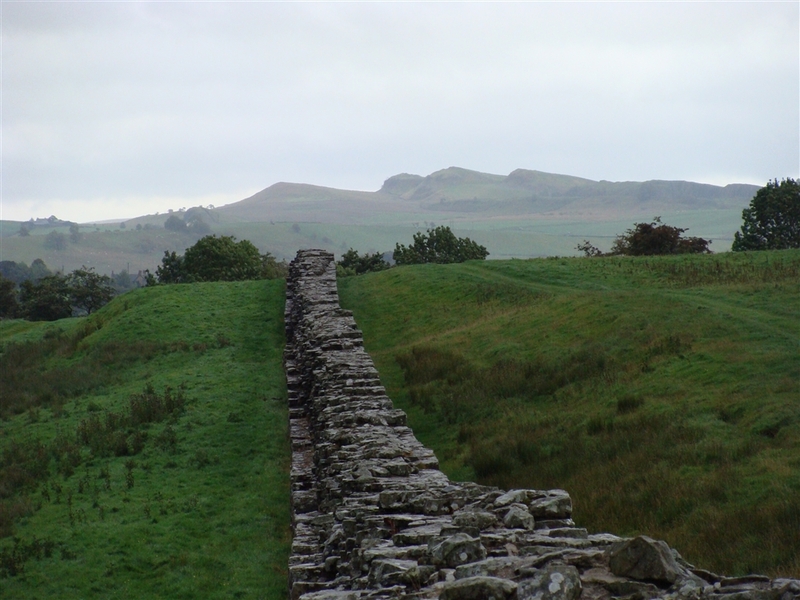 Finally, on the last day, we decided to head east of Carlisle and see the famous Hadrian’s Wall. It is one of the attractions which (unlike the Hardknott Fort) probably everyone knows about. I don’t even remember when I heard about it for the first time. Probably when I was attending my primary school, well over 20 years ago and 2000km away in a Polish mining town. Such is its fame. So we were full of anticipation and didn’t let the absolutely horrible weather to scare us off. We followed the A69 (which is dead straight for quite a long stretches and reminded me American roads more than the British ones) to local B6318, before finally arriving to Waltown Quarry, which we chose as a staring point for a short walk along the wall. I know that a lot what is visible today is actually a 19th century restorations but it doesn’t change the fact that it is a spectacular site indeed. And still, plenty of original bits survived as well. As with Hardknott Fort I found it fascinating being able to follow the footsteps of Roman soldiers and imagine their life back then. We followed the wall for a bit, reaching some spectacular sections located probably about a mile east of the quarry where we started. We could (and wanted) to go further but by then the weather got really nasty, with driving horizontal rain making a splendid job in trying to send us back to where we came from. I really felt sorry for the Roman legionaries who were stationed here, some of them for many years and thousands of kilometres from home. 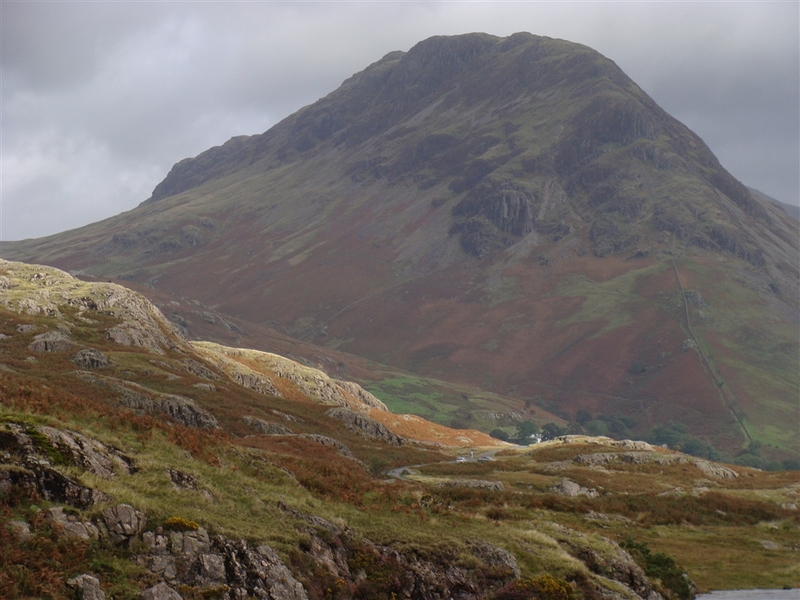 In general we really enjoyed our few days in the Lake District and surrounding region. Sure, the weather was far from perfect, but what else one should expect out there? If we wanted a glorious sunshine we would have gone to Spain. But we prefer rugged, dark and mysterious landscapes of the north than boring touristy costas of Spain. Sure, a little bit less of the rain would help but one shouldn’t moan too much. And the Roman sites must be absolutely fascinating for a anyone with even minimal interest in history. In short it was a great trip which I would gladly repeat, I would especially like to come back to visit some other sections of the wall. And I’m sure I will. This entry was posted in Uncategorized and tagged Hadrian's Wall, Hardknott Pass, Hardknott Roman Fort, Honister Pass, Kirkstone Pass, Lake District, Wast Water, Windermere, Wrynrose Pass by Geogregor. Bookmark the permalink.